When it comes to lifting, no vehicle or land-based crane can compete with the impressive abilities of helicopters. Helicopters can lift over 50 tons of payload, get the job done faster, place the materials precisely where they go and access remote locations to do it. Heavy Lift Helicopters have been the top choice for civilians, corporations, and military branches worldwide for heavy load transfers since their implementation before the 40’s. They can land and lift off from nearly anywhere in the world and provide a versatile means for the movement of large air freight cargo and evacuations of troops worldwide. So which heavy lift helicopters are the best? Trying to answer the question of how much weight can a helicopter lift? 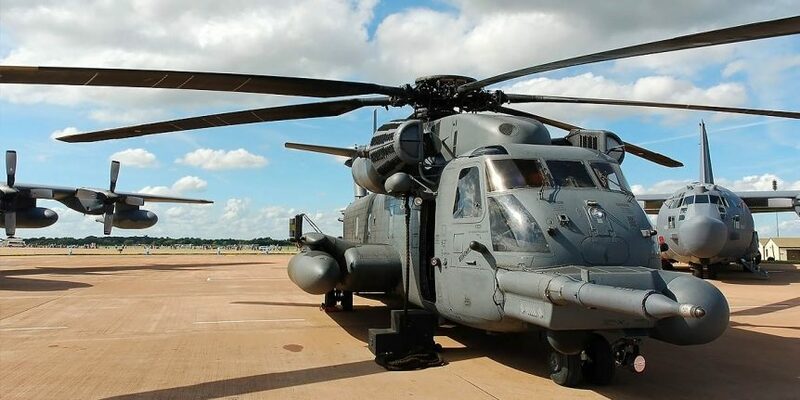 Let’s take a look at the Top 7 Best Heavy Lift Helicopters. It goes to show, this Goliath among helicopters is undisputed in terms of size, power and load capacity. This improvement to the original Mi-6 entered service in 1961. Operated by the Russian Air Force and many other smaller civil agencies, it has many noticeable improvements such as fuselage with the shallower cabin but a deeper tail boom for more load to be hoisted and a twin-wheeled undercarriage to further enhance its heavy lift capacity. This incredible helicopter has an additional wide-track, four-legged, extended landing gear to allow it to straddle bulky cargoes. Now called the Airbus H225M Cougar, this aircraft was originally named the Eurocopter EC725 Caracal. This long-range tactical transport military was developed from the Eurocopter AS532 Cougar for military use and is one of the most celebrated helicopters in the Cougar family of twin-engine Eurocopter. The H225M Cougar is suitable for an array of missions including maritime surveillance, ground logistical support, Search and rescue (SAR) as well as Combat Search and Rescue (CSAR) operations. Originally designed by the Soviet Union, this medium twin-turbine helicopter has been used as an airborne command post, a transport helicopter, armed gunship and a reconnaissance platform. It also has the abilities to be considered for rescue operations with its side cabin boasting a lift capacity of 250 kg. As of 2015, the Mi-8 is among the world’s most produced helicopters, used in over 50 countries and the third most common operational military aircraft in the world making it the most popular military helicopter on our list of best heavy lift helicopters. From the same family as the civilian S-92 and its improvement the H-60 in the utility transport role, the H-92 Superhawk is capable of carrying 22 troops. Part of the same family as the Seahawk and the Blackhawk, it’s first flight was in 1998 but entered service much later in 2004. The CH-148 Cyclone is a shipboard maritime helicopter variant of the H-92 under development for the Canadian Forces. The Ch-54 Tarhe is also referred to as the flying insect or the Skycrane. Both names are a result of the unique physical and technical qualities of the aircraft, skycrane coming from its ability to lift heavy cargo in critical missions and “flying insect” for its unusual shape. The development of this aircraft was initially for recovery missions when loads were too heavy for the CH-47 Chinook. Making its first flight in 1962, #6 on the list of best heavy lift helicopters gets its name from a remarkably tall Indian chief who lived between 1742 and 1812. Making its first flight in 1974, the Sikorsky CH-53 Stallion entered service in 1981 under the US Marine Corps. Currently the largest and heaviest helicopter in the U.S. Military fleet, there have been a total of 172 stallions delivered out of which 162 are in service with the Atlantic and Pacific fleet. The CH-53 Stallion is nicknamed the Hurricane Maker, from the downwash it generates and can lift aircraft as heavy as itself. When it comes to heavy lifts, there are many industries that can benefit from these huge helicopters. Executives use lifts as a means of transportation to and from business locations. The transport of materials to offshore drilling locations or logging materials to remote forest sites also require the use of heavy lift helicopters. Emergency services require heavy-lift helicopters to deliver much-needed goods and to retrieve people during evacuations and rescues. There is a variety of commonly used helicopters, all offering different benefits for different situations. If you have a heavy lift project and need to discuss options with our experts call us today, the quote is free and so is the consultation. We are happy to answer any questions you may have about heavy lift helicopter operations and how they can assist you.